As of 1st July 2013 Google Reader will power down and be just a memory in our news feed lives. Google (as stated in their Official Blog) have made this decision due to declining numbers of people using the resource, and the desire to focus on fewer things in order to make those things even better for their users. A logical argument, but what will we do without it? I’ve been using Google Reader now pretty much since it launched back in 2005. I have it just the way I want it, with all my categories set up and the feeds filtering into them nicely on an hourly, daily and weekly basis. So what can those of us who use Google Reader do now? Well Google is very kindly announcing this early so that you have the next 3+ months to find an alternative solution. They are also enabling you to export the data currently stored in Reader (including your subscriptions) to your new solution using Google Takeout. And what are the options to replace Google Reader? This is a free service available for your desktop, as well as for iOS and Android mobile devices. Cleverly foreseen by the team at Feedly and certainly gets my vote for migrational ease! Another good choice, it’s also available for your desktop, iOS and Android mobile devices. There is a free version but it does have a few restrictions; such as the amount of sites you can set up and the amount of news it will show at one time. However the paid for version is just $1 per month which unlocks the amount of sites to an unlimited status and shows all your stories at once. Again with Newsblur you can apparently import your Google Reader subscriptions via their system, making it another easy solution. 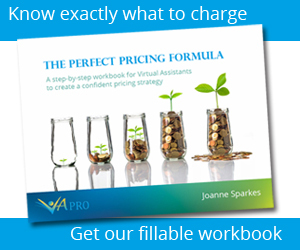 This is a free option available on desktop and also as an online version, allowing you to view your feeds from any web browser, on any device, without installing any software. But I also wanted to mention another choice, outside of those list above as recommended by the tech industry. 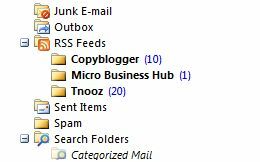 If you’re already using Microsoft Outlook, you can set up RSS feeds easily within its program to direct news straight into a dedicated RSS inbox. 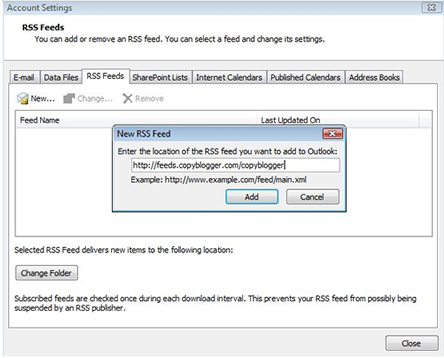 If you don’t already know how to set up an RSS feed in Outlook, it’s really simple. Click into ‘Tools’ from the top menu. Then click the ‘Add New’ button and add your feed to the box that appears. Confirm you’d like the feed to go into your RSS folder (if not you can change it). Your RSS inbox will have those feeds set up and active. Do you have an alternative that you think will do the job better? If so, please leave your comments below. Previous articleHow easy have you made it to be contacted by new clients?